Q.1) Short Notes on following terms ? Q.2) Describe the characters of marginal costing ? 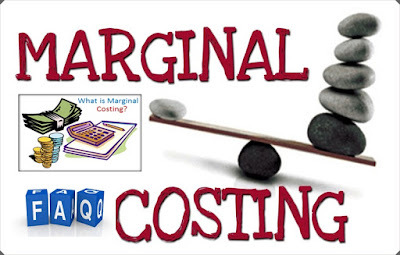 Q.3) Difference between marginal and absorption costing ? Q.4) Explain advantages and limitations of marginal costing ? Q.5) Explain the practical application of marginal costing? Q.6) Explain meaning of margin of safety? State the relationship between MOS ratio and operating leverage? MOS is the excess of actual total sales over break even sales ? Q.1 Short Notes on following terms ? Profit = Contribution – Fixed cost whereby Contribution = Sales – Variable Cost. Under this technique, variable cost is treated as relevant production cost while fixed cost is treated as period cost which is independent of level of production. 3. Direct Costing: it is the practice of charging all direct cost to products and all indirect costs is written off against profits in the period in which they arise. Under direct costing, the stocks are valued at direct costs whether fixed or variable which is directly attributable to the cost units. selection of an additional sales channel. 5. Contribution:- it is the difference between sales value and marginal cost(variable cost). a. While deciding acceptance or rejection of a new order, contribution from new order is compared with contribution on earlier production on the basis of per unit and finally highest contribution giving option is adopted. b. While deciding between different methods of production, the method which generates higher contribution is considered. Shortage of Plant capacity available. 7. Cost Volume Profit Analysis:- As the name suggests, cost volume profit (CVP) analysis is the analysis of three variables cost, volume and profit. Such an analysis explores the relationship between costs, revenue, activity levels and the resulting profit. It aims at measuring variations in cost and volume. 1. Changes in the levels of revenues and costs arise only because of changes in the number of product or services units produced and sold. 2. Total costs can be separated into two components; fixed cost which does not vary with level of output and variable cost which varies with level of output. variable costs include both direct variable costs and indirect variable costs of a product. Similarly, fixed costs include both direct fixed costs and indirect fixed costs of a product. 3. When represented graphically, the behaviours of total revenues and total costs are linear in relation to output level within a relevant range and time period. 4. Selling price per unit, variable cost per unit, and total fixed costs are constant. 5. All revenues and costs can be added, subtracted, and compared without taking into account the time value of money. 1.The behave of cost in relation to level of activity. 2. Volume of production or sales, where the business will break-even. 3. Relation of profits to variation in level of output. 4. Amount of profit for a projected sales volume. 5. Quantity of production and sales for a target profit level. 8. Contribution to Sales Ratio or Profit Volume Ratio or P/V ratio):- This ratio is usually expressed in percentage. A higher contribution to sales ratio implies that the rate of growth of contribution is faster than that of sales. This is because, once the breakeven point is reached, profits shall grow at a faster rate when compared to a product with a lesser contribution to sales ratio. Margin of safety shall be NIL when actual sales is equal to breakeven sales level. 11. Angle of incidence:- At break even chart, this angle is formed at intersection of total sales line and total cost line. This angle shows the rate at which profits are being earned once the break -even point has been reached. The wider the angle the greater is the rate of earning profits. A large angle of incidence with a high margin of safety indicates extremely favourable position. Q. 2 Describe the characters of marginal costing ? All types of cost are classified into fixed and variable cost. Semi-variable costs are also analysed into fixed and variable cost. The marginal or variable costs (as direct material, direct labour and variable factory overheads) are treated as product cost. Under marginal costing, the value of finished goods and work–in–progress is also comprised only of marginal costs. Variable selling and distribution and fixed costs are not considered for valuation of closing stock of finished goods and closing WIP. Fixed costs are treated as period costs and are charged to profit and loss account for the period for which they are incurred. Prices are determined with reference to marginal costs and contribution margin. Profitability of departments and products is determined with reference to their contribution margin. Q.3 Difference between marginal and absorption costing ? Fixed cost is treated as period cost. The profitability of different products is judged by their P/V ratio. Fixed cost is treated as product cost hence charged to cost of production. The profitability of different products is derived after reducing share in fixed cost. Only Variable cost is considered for costing the product and for inventory valuation. Both fixed and variable cost are considered for costing the product and inventory valuation. Cost data is presented to highlight the contribution of each product. Cost data is presented to highlight the profit of each product. Net profit of each product is derived after deducting fixed cost along with their variable cost. The difference in the magnitude of opening and closing stock does not affect unit cost of production. The difference in the magnitude of opening and closing stock does affect unit cost of production due to impact of related fixed cost. Cost per unit of production remains same irrespective of production level since it is values at variable cost. Cost per unit of production reduces as the level of production increases since fixed cost per unit reduces with level of production increases. Q. 4 Explain advantages and limitations of marginal costing ? Simplified pricing policy:- variable cost per unit remains the same while fixed cost remains constant in total. So it is easy to decided pricing policy as against to technique where unit cost per unit keeps on changing due to inclusion of fixed cost & change in level of output. Proper recovery of overheads:- In costing, overheads are recovered on the basis of pre-determined rates. If fixed overheads are included on the basis of pre-determined rates, there shall be under recovery of overhead if production is less than the budget and there shall be over recovery of overhead if production is more than the budget. Hence this created problem of treatment of such under or over recovery of overheads. Marginal costing avoids such over or under recovery of overheads. Shows realistic profit:- valuation of stock of finished goods and work in progress is carried out on variable cost basis and fixed cost is written off to profit and loss account as period cost. This shows true profit. How much to produce:- it helps in preparation of break-even analysis which shows the impact of increase or decrease in production level on profitability of the company. More control over expenditure:- segregation of expenditure into fixed and variable helps management to exercise control over expenditure. Management can compare actual variable exp. With budgeted variable exp. And take cporrective action, if needed. Helps in decision making:- it helps in taking a number of decisions e.g. make or buy, discontinuance of a product etc. Short term profit planning:- it helps in short term profit planning by Bear even points charts. Difficulty in classifying fixed and variable elements: It is difficult to classify exactly the expenses into fixed and variable category. Most of the expenses are neither totally variable nor totally fixed. For example, various amenities provided to workers may have no relation either to volume of production. Dependence on key factors: Contribution of a product itself is not a guide for optimum profitability unless it is linked with the key factor. Scope for Low Profitability: Sales staff may mistake marginal cost for total cost and sell at a price; which will result in loss or low profits. Faulty valuation: Overheads of fixed nature cannot altogether be excluded particularly in large contracts, while valuing the work-in- progress. In order to show the correct position fixed overheads have to be included in work-in-progress. Unpredictable nature of Cost: Some of the assumptions regarding the behaviour of various costs are not necessarily true in a realistic situation. For example, the assumption that fixed cost will remain static throughout is not correct. Fixed cost may change from one period to another. For example salaries bill may go up because of annual increments or due to change in pay rate etc. The variable costs do not remain constant per unit of output. There may be changes in the prices of raw materials, wage rates etc. after a certain level of output has been reached due to shortage of material, shortage of skilled labour, concessions of bulk purchases etc. Marginal costing ignores time factor and investment: The marginal cost of two jobs may be the same but the time taken for their completion and the cost machines of used may differ. The true cost of a job which takes longer time and uses costlier machine would be higher. This fact is not disclosed by marginal costing. Understating of W-I-P: Under marginal costing stocks and work in progress are understated. Q.5 Explain the practical application of marginal costing? Pricing Policy:- since variable cost per unit remains same from period to period, firm decisions on pricing policy can be taken particularly in short term. Ascertaining realistic profit:- valuation of stock of finished goods and work in progress is carried out on variable cost basis and fixed cost is written off to profit and loss account as period cost. This shows true profit. Determination of production level:- Marginal costing helps in the preparation of break-even analysis which shows the effect of increasing or decreasing production activity on the profitability of the company. Shut down business:- An entity can continue to operate till sales revenue are sufficient to cover variable cost and avoidable fixed cost. Q.6 Explain meaning of margin of safety? State the relationship between MOS ratio and operating leverage? MOS is the excess of actual total sales over break even sales. ? MOS is the excess of actual total sales over break even sales. If sales are expected to increase, lower operating leverage will result in higher profit and vice-versa. High variable cost and low fixed cost results in higher MOS and thus risk will be lower and vice-versa.So like operating leverage, MOS is measure of risk as to what extent an organisation is exposed to change in sales. Click here for your tube link and have understanding of marginal costing concepts. FOR other useful videos on IPC – COST & FM and CA-Final – Advance Management Accounting videos subscribe channel Youtube Channel Nam.